On The Go Tours offer a wide range of African Safaris including Family Adventures and when you book one spot on an Overland Camping Safari between now and 31 October 2014 you will get the second spot free. On the Go Tours offer family friendly departures on selected dates on their ‘Falls to Johannesburg’, ‘Wildlife, Beach & Falls’ and ‘Southern Circuit’ tours . These Southern Africa camping safaris are suitable for parents travelling with children and teens aged 6 to 17 and cost from £350 land only. Valid for travel up until 31 December 2015 and full payment required at time of booking. via Africa Safaris | Safaris to Africa | On The Go Tours. Take advantage of some great value term time family short breaks at Bluestone Wales. Perfect for young families there is 500 acres of car-free countryside to explore. Let your little one become a Mini Ranger (0-3 years) or Junior Ranger (4-7 years). 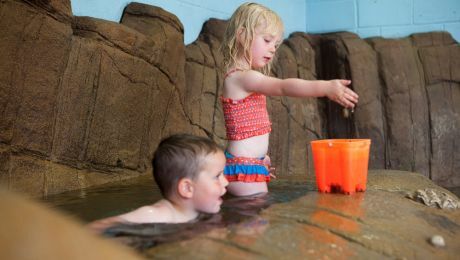 Babies and toddlers can have fun in the safe sandy bay of the Blue Lagoon Water Park and enjoy the Circus Zone in the Adventure Centre. Junior Rangers can experience a range of hands-on nature activities and get to grips with indoor climbing. A 2 bedroom cottage sleeping a family of four is available the 13 October for just £239 for a 4 night mid week break. A range of accommodation options are available including cottages, lodges and a larger properties. Toddler and Baby Friendly Short Breaks – Bluestone Wales.. The Adventure Company has a great choice of family wildlife adventure holidays and if you book by 30 September 2014 you can get 10% off selected holidays. Visit Borneo and experience a local village homestay, get up close to orangutans and stay in a jungle eco-camp. Or maybe go overlanding in East Africa exploring the vast Serengeti and visiting local schools and communities. Or if you’re with older kids try a teenage adventure in South Africa. There are also holidays to the Galapagos and Kenya. Prices from £1161 per person and with departures in 2015. Here are some great summer offers from PGL on summer family adventures including ‘parents go free in the UK and France’, ‘kids go free’ and ‘20% off for children and teenagers’. I love the sound of their ‘Wild on the Isle of Arran’ adventure holiday where you stay at a families only centre. With sea cliffs to abseil, boulders to climb and forest tracks to explore on mountain bike this is great for lovers of the great outdoors. There is also wonderful wildlife to spot including red deer, peregrine falcons and golden eagles. On this holiday 1 child goes free with every paying adult (£519) for 7 nights saving £449 per child. Offer applies on 2 and 16 August arrivals. PGL Family Adventures – Special offers on holidays. PGL has a great ‘kids go free’ offer on their Paris and Disneyland family adventure holiday. Combine three days of multi-activity fun with a sightseeing day trip to Paris plus park entry tickets for Disneyland Paris. Take up to two children aged five and over for free. This holiday is based at PGL’s Château de Grande Romaine centre just 30 minutes from Disneyland. Set in 70 acres the site boasts an outdoor heated pool, a football pitch, tennis courts and a host of other activities including ropes courses, archery, a trapeze and zip wire thrills. With this offer a family of four (2 adults and 2 children) can save a massive £890 on this seven night holiday. The price includes accommodation in an ensuite family room, all meals, use of equipment, instruction and family-friendly evening fun as well as the activities and sightseeing. Kids go free on seven-night holidays starting 27 July, 3 August, 17 August and 24 August. Quote FAB2X when booking. Prices from as little as £978. PGL Family Adventures at Chateau de Grande Romaine. Families Worldwide Active Turkey is a 7 night family adventure holiday based in Adrasan Bay. Highlights include: exploring inlets and caves by kayak; discovering the sunken city of Kekova by boat; gorge walking plus swimming and snorkeling in turquoise waters. There are additional optional activities including rock climbing, a visit to a Turkish bath, pony trekking, paragliding, SCUBA diving, climbing and zip wires, Turkish dancing and the opportunity to walk some of the Lycian Way. Most of the activities suit children aged 8+. Summer departures during July and August. Land only price £679; child £659. Teen departures on 18 July and 15 August kids2014. Family adventure holidays to Turkey – Active Turkey. Preseli Venture Family Adventure Pembrokeshire offers you and your family the perfect opportunity to experience unique and exciting adventure activities under the expert guidance of professional guides. Stay at a fully catered 5 star eco lodge or a geodesic dome. Typical activities include: coasteering, surfing, sea kayaking, horse riding, kite boarding. There are two options available ‘Action Packed’ and ‘Action & Relax’. Run every week throughout the summer. Holiday prices: adults £479 and under 16s £379 on Action & Relax programme. Family adventure holidays, UK | family activity holidays Pembrokeshire, Wales. Single Parents on Holiday Farm Holiday Italy. Discover life on the farm in the beautiful Friulian Dolomites, a UNESCO World Heritage Site. You will be based at Gelindo dei Magredi Farm which is located in the Magredi, a huge nature park. A 6 day family activity programme is on offer for all ages and may include any of the following a local farm visit with farm museum, a guided bike tour, a mosaic making course, an Italian cooking course, a horse drawn carriage tour, horse riding. food and wine tasting, a trip to the beach, fruit and vegetable picking, jam making, cheese making, a day visit to Venice. Parents can either join in the activities or relax by the pool. Holidays depart 26 July to 2 August and 2 to 9 August 2014. Adults £710, children under 11 £610, children 12-15 £650 and 25% discount on 2nd & 3rd child under 12. Single Parent farm holiday in rural Italy with great family activity programme. Valkyrie Pursuits has designed a unique Snowdonia mini adventure break where as a family you will scale rock walls, descend gorges, stand tall upon mountains and canoe across magical lakes. The 2 night, 2 day package includes three half day activities normallu including rock climbing, gorge scrambling/canyoning and canoeing. Accommodation is in tents which are provided as well as all of the activity equipment. The break is tailored to the experience & capability of the individuals in the group. Check here for available dates over the summer holiday period. Cost is from £99. Snowdonia Mini Adventure Break – Valkyrie Pursuits Reservations. Explore! has a new family tour to taking in the sights of Malta and Gozo. Highlights include a jeep safari on the island of Gozo exploring scenic wonders and historic sites, sea kayaking the coastline, a boat trip to Comino Island and a visit to Malta’s historic capital. There are plenty of opportunities for swimming with the hotel right by the sea. From £649 without flights and £922 with flights. Departures in May, July, August and October 2014. Group size 14-20 people. Minimum age is 7 and there are teenage departures too. Book by by 30 January 2014 for the 5% discount. Book by the 18 November and save 5% on Explore’s exciting range of family adventures. Whether you choose to travel at Christmas, February half term, Easter, May half-term or over the summer holidays then there will be an experience that’s just right for you and your family. There is also a 5% saving when you book one of Explore’s 12 exciting new 2014 family adventures with destinations including Sri Lanka, Canada, France & Switzerland, Turkey, Belize and Latvia amongst others. Visit a secret Soviet nuclear bunker, go on an elephant safari or travel the coast line by boat & kayak are just some of the activities on offer. You will need to book by 18 November 2013 and mention the offer at the time of booking for the discount to be applied. Family Adventures – Save 5%.